Keywords: Drug discovery, Drug design, Databases, In silico, Online computations, QSAR. Keywords:Drug discovery, Drug design, Databases, In silico, Online computations, QSAR. Abstract:The review describes online resources used for drug discovery and design. Internet resources can be classified into two classes. The first class of resources accumulates information about drugs, drug candidates, compounds, and bioassays. This information is a starting point in drug discovery and design. It is necessary for a training dataset composition. The data found at this step are needed in the search for the rules predicting a biological activity or recognizing active compounds among other molecules. The following databases can be used: ChEMBL, different databases of US National Institutes of Health, DrugBank, PDBind-CN Database, RCSB Protein Data Bank (PDB), BRENDA, etc. The second class of Internet resources includes web-portals performing online computations for drug discovery and design. 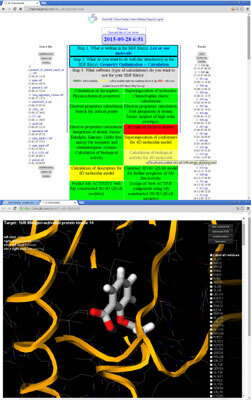 The web-portals perform: 1) modelling of molecular structure such as geometry optimization and molecular docking; 2) online computations of various descriptors, physical-chemical and ADMET properties influencing the bioprocesses occurring in a living organism along the road of the drug therapeutic action; 3) quantitative structure-activity relationship (QSAR) and quantitative structure-property relationship (QSPR) studies; 4) prognosis of bioactivities of compounds; 5) design of new drug candidates. These are, for example, ChemAxon, ACD/ I-lab, Mcule, OCHEM, eADMET, ChemoSophia, DockingServer, 1-click Docking, MDWeb, DockingServer, ZDOCK, etc. The role of docking online resources for modeling of “ligand-receptor” complexes, prognosis of bioactivities, and drug design is discussed. The review highlights the possibilities of Internet resources for a study of a drug action at the most important stages. A detailed assessment of the advantages of the reviewed Internet resources is done.